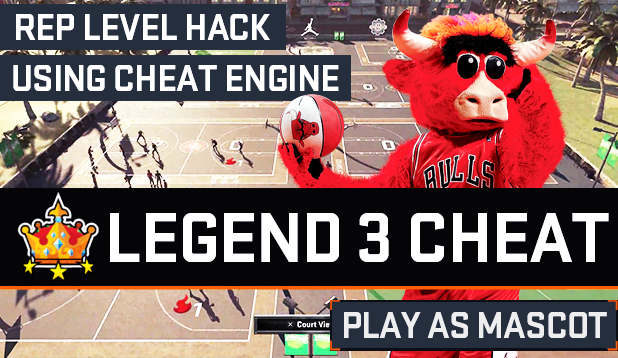 This tutorial for NBA 2K15 PC will show you how to hack your rep level in MyPARK, so that you can reach Legend 3 right away and play as a mascot. Before we begin, you must install a program called Cheat Engine on your computer. You can download it by clicking this link. If you already have it proceed below. Step 1: Run NBA 2K15 on Steam, and go to MyPARK. Step 2: Minimize the game once the park has fully loaded. Step 3: Open the cheat table and click the “Open Process” button. Step 4: Select NBA2K15.exe from the list. It will ask you to keep the current address list/code list, choose 'Yes'. Step 6: Freeze the value (✕) and go back to NBA 2K16. Step 7: Go to MyPLAYER Store and you should be able to buy all available mascots. Each of them cost 100,000 VC each. Reaching Legend 3 in NBA 2K15's MyPARK has many advantages. One of them is 'Got Next VIP', which basically allows you to kick lower rep players and steal their spot. Have fun! You can watch Nico's video tutorial below if you're having trouble following the guide.